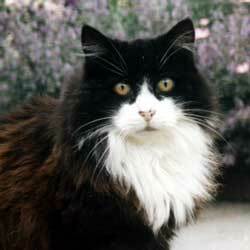 Jeremy was Stephen's black and white fluffy cat. She lived the last three years of her life here in the country. For her it was not the most peaceful of retirement homes - there was a DOG (scary), two grey ugly sister cats (more scary), a large ginger outdoor cat (even more scary), and others. There was country wind (scary) which made the leaves fall from the trees (more scary) and made loud noises down the chimney (even more scary). As you can see, it's hard to describe Jeremy without insulting her. She was always a bit pathetic, timid, and frightened of everything. Yet she was a silly smoochy cat too, gentle and loving and extremely loyal. 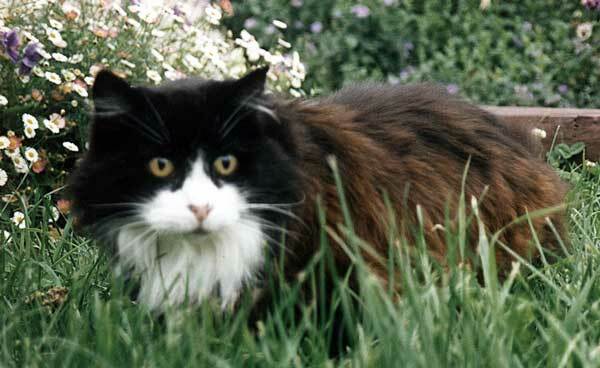 Jeremy is the only deceased cat after which a part of the garden is named. Her memory is honoured by Jeremy's Border, in which she is composting quietly under a small lemon rose. Jeremy never really enjoyed the garden, though she liked being carried around. Things like wind and falling leaves put her off. The two grey sisters were a bit unkind too, stalking her and jumping out from bushes as she slinked past, belly on the ground. Jeremy never really enjoyed the garden, as she never managed to find a garden area that she felt truly safe in. The two greys would inevitably find her hiding place and torment her by staring and howling quietly. That was enough to see her scuttling for the safety of the house. Poor Jeremy.